In what has almost become a custom in the Lone Star state over the last two state legislative sessions, a new bill has been introduced to move the Texas primary from the first Tuesday in March to the fourth Tuesday in January. Unlike the bill recently introduced further west in Oregon, this is not a new potential swipe at New Hampshire and the other carve-out states. In fact, Lyle Larson (R-122nd, San Antonio) has made this a habit since 2015. But this is merely the representative's third try at a "why not Texas?" bill; one he called a "flamethrower" intended to send a message in 2017. And the current legislation -- HB 725 -- is likely to continue to get the same sort of reaction. Other members on the committee will like the idea of Texas stealing the spotlight, but elections administrators from the county level will balk as will the two major parties in Texas. The latter continues to take issue with the move because of the implications -- national party penalties -- it would have for the delegations the state would send to the national conventions in 2020. The 2015 version failed to get out of committee, but the 2017 version cleared that committee hurdle only to die from inactivity when the session adjourned. The 2019 version is likely to meet a similar fate. 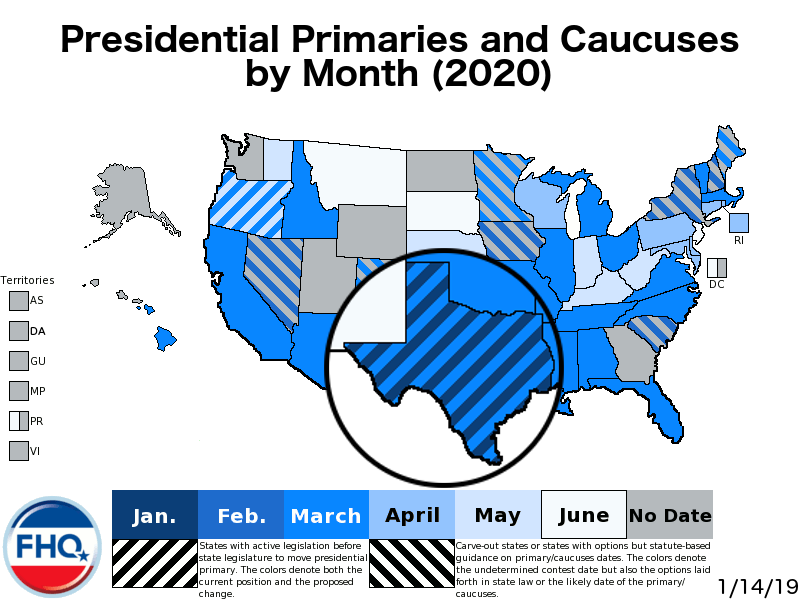 Historically, Texas just has not budged much from its primary positions. Legislators have only willingly moved the primary twice in the post-reform era; once from May to March for 1988 and again from March to earlier March for 2008. Redistricting dispute forced the state to shift to a late May primary for the 2012 cycle. More on the history of attempted Texas primary movement here. 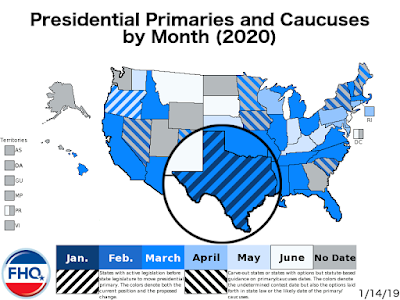 The Texas bill has been added to the FHQ 2020 presidential primary calendar.